Photos courtesy of Jeremy Daniel, Ed Krieger, and Justin Barbin. 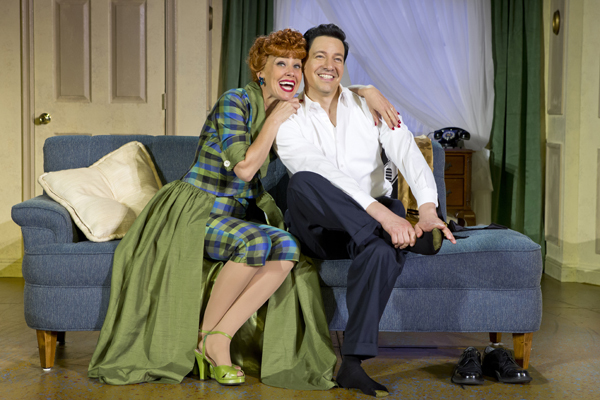 She's home, home being the Segerstrom Center for the Arts where, for an excruciatingly brief run, Rick Sparks is directing I Love Lucy: Live on Stage. 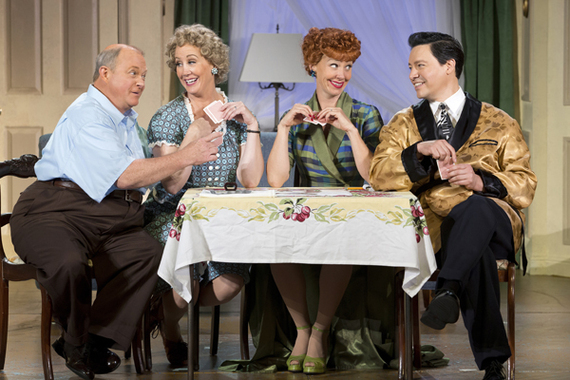 Set in the Desilu Playhouse, the production situates the performance's audience as the live audience for the 1952 filming of two I Love Lucy episodes, "The Benefit" and "Lucy Has Her Eyes Examined." Depending on your age, the production is nostalgic, funny as hell, a classic, or the 21st century equivalent of bitchin' awesome. As much about the experience of the filming of the two shows as it is about the two shows themselves, it gives us a chance to revisit -- this time in color; this time in person and not on a TV screen slighter bigger than a laptop -- the now-so-innocent antics of the Ricardos and the Mertzs. The TV re-runs are still funny. So is this production. It points to both the iconic status of the TV show as well as the excellent staging of this production. Aaron Henderson's set design is gorgeous. It puts us smack dab in the Playhouse's production studio, which in turn puts us in Ricky's club and the Ricardo's living room. The nightclub's colors are appropriately flamboyant -- vibrant greens and yellows; and the costumes are anything but the shades of gray we see/saw on TV. Even the living room doesn't seem so drab. The most astonishing thing, color-wise, is Lucy's hair. It's redder than red is red. Sparks' pacing is nimble and deft. The production bounces along from pre-filming banter and audience conversation to the insanely perfect comic timing of the two shows filmed. The TV shows always had a vaudeville rhythm, seemingly spontaneous -- and all the more funny for that. So does this production. The acting is spot-on and wildly entertaining. The actors don't need capture each nuance of their respective character because, among other things, this production pays homage to the show, "in the manner of." It's here that each of the four principals shine. Joanna Daniels and Kevin Remington are fantastic as the Mertz's. Based on their performances, you can easily see how there could have been a successful Fred and Ethel Show spin-off. They're the perfect foils to the Ricardos. They aren't as volcanic as their neighbors but, then, they're been married much longer. Can you imagine Lucy and Ricky at retirement age? Bill Mendieta nails Ricky. He's handsome, he's flirty, and he's charismatic. 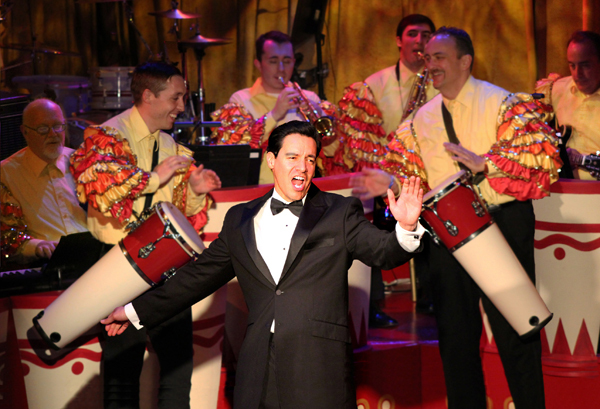 He's got the Cuban's accent (and the sometimes fractured English), the singing voice, and a swagger that only Lucy could chop down a notch. How does that happen? 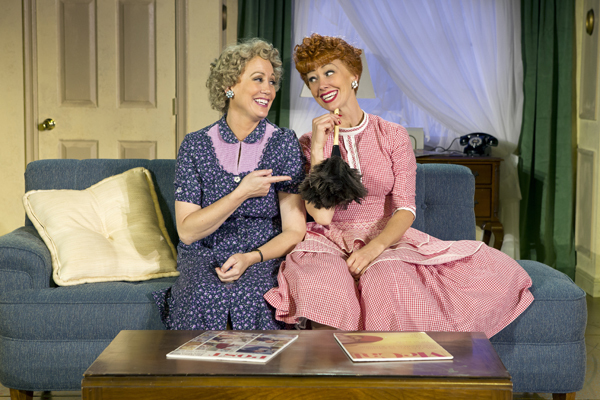 Because Sirena Irwin's Lucy is a force of nature. You could close your eyes and imagine Lucy from Irwin's voice alone, especially when she utters her trademark (and unspellable) "ewww." Her Lucy is larger than life -- she has to be because Mendieta's Ricky would overwhelm or otherwise charm everyone off the set. Besides, given the show's title, you have to imagine it's told from Ricky's point of view. He's clearly in awe, exasperated awe, of her. It's an evening of utter enchantment. 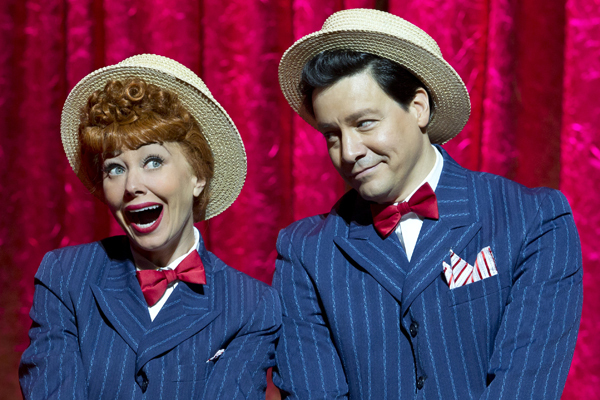 There are the two skits -- just watch an almost-blind Lucy try to jitterbug. There's the color, which brings the production to life. And there are the performances. But the one thing you could never get from watching the two episodes in re-runs is the experience of being in the studio audience. Not only are we there, watching the whole thing live (including flubs that you would nowadays find as outtakes), we get to see the commercial jingles sung and danced, providing another layer of entertainment to an experience that is so captivating, so far removed from current sitcoms and reality shows, that you can only conclude that not only does Ricky love Lucy, you do too. Shout out video from the cast. Performances are 7:30pm, Tuesday - Saturday, 2pm, Saturday, and 1pm and 6:30 pm, Sunday. The show runs until March 23. Tickets are $29 - $99. The Center is located at 600 town Center Drive, Costa Mesa, CA. For more information, call (714) 556-2121 or visit www.scfta.org.